Circe dropping her cup and fleeing Odysseus across the lower teir of an Attic red-figure crater (c. 440 BC). Circe, depicted on a Sicilian altar (c. 525 BC). 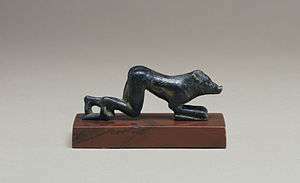 One of Odysseus's men turning into a pig (5th c. BC). 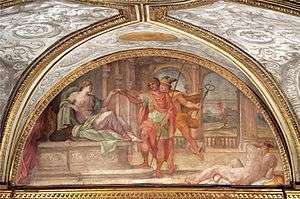 Carracci's c. 1590 Ulysses and Circe in the Farnese Palace. Circe (/ˈsɜːrsiː/; Greek: Κίρκη, In Greek mythology, Circe (/ˈsɜːrsiː/; Greek Κίρκη Kírkē pronounced [kírkɛ͜ɛ]) is a goddess of magic (or sometimes a nymph, witch, enchantress or sorceress). By most accounts, Circe was the daughter of Helios, the god of the sun, and Perse, an Oceanid. Her brothers were Aeetes, the keeper of the Golden Fleece, and Perses. 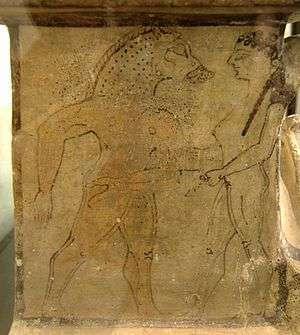 Her sister was Pasiphaë, the wife of King Minos and mother of the Minotaur. Other accounts make her the daughter of Hecate, the goddess of witchcraft herself. Circe was renowned for her vast knowledge of potions and herbs. Through the use of these and a magic wand or a staff, she transformed her enemies, or those who offended her, into any kind of animals. Some say she was exiled to the solitary island of Aeaea by her subjects and her father Helios for killing her husband, the prince of Colchis. Later traditions tell of her leaving or even destroying the island and moving to Italy, where she was identified with Cape Circeo. In Homer's Odyssey, Circe is described as living in a mansion that stands in the middle of a clearing in a dense wood. Around the house prowled strangely docile lions and wolves, the drugged victims of her magic; they were not dangerous, and fawned on all newcomers. Circe worked at a huge loom. She invited Odysseus' crew to a feast of familiar food, a pottage of cheese and meal, sweetened with honey and laced with wine, but also laced with one of her magical potions and drunk from an enchanted cup. Thus so she turned them all into swine with her magic wand or staff after they gorged themselves on it. Only drunken Eurylochus, suspecting treachery from the outset, escaped to warn Odysseus and the others who had stayed behind at the ship. Odysseus set out to rescue his men, but was intercepted by the messenger god, Hermes, who had been sent by Athena. Hermes told Odysseus to use the holy herb moly to protect himself from Circe's wizardry and, having resisted it, to draw his sword and act as if he were to going to attack her. From there, Circe would ask him to bed, but Hermes advised caution, for even there the goddess would be treacherous. She would take his manhood unless he had her swear by the names of the gods that she would not. Odysseus followed Hermes' advice, freeing his men and then remained on the island for one year, feasting and drinking wine. According to Homer, Circe suggested two alternative routes to Odysseus to return to Ithaca: toward Planctae, the "Wandering Rocks", or passing between the dangerous Scylla and the whirlpool-like Charybdis, conventionally identified with the Strait of Messina. She also advised Odysseus to go to the Underworld and gave him directions. Dionysius of Halicarnassus (1.72.5) cites Xenagoras, the second century BC historian, as claiming that Odysseus and Circe had three sons: Rhomus, Anteias, and Ardeias, who respectively founded three cities called by their names: Rome, Antium, and Ardea. In a very late Alexandrian epic from the 5th century AD, the Dionysiaca of Nonnus, her son by Poseidon is mentioned under the name of Phaunos. George Romney's c. 1782 portrait of Emma Hamilton as Circe, subsequently used to illustrate numerous books, including Wuthering Heights. In botany the Circaea are plants belonging to the enchanter's nightshade genus. The name was given by botanists in the late 16th century in the belief that this was the herb used by Circe to charm Odysseus' companions. Medical historians have speculated that the transformation to pigs was not intended literally but refers to anticholinergic intoxication. Symptoms include amnesia, hallucinations, and delusions. The description of "moly" fits the snowdrop, a flower that contains galantamine, which is an anticholinesterase and can therefore counteract anticholinergics. ↑ William Godwin (1876). "Lives of the Necromancers". p. 43. ↑ Chisholm, Hugh, ed. (1911). "Circe". Encyclopædia Britannica. 6 (11th ed.). Cambridge University Press. p. 381. ↑ "iv:659-84". Gutenberg.org. Retrieved 2014-03-19. ↑ "Dryden's translation". Classics.mit.edu. Retrieved 2014-03-19. ↑ "Online translation". Theoi.com. Retrieved 2014-03-19. ↑ Pages 1-69. Books.google.fr. Retrieved 2014-03-19. ↑ Oxford Dictionary Archived June 10, 2015, at the Wayback Machine. ↑ Plaitakis A, Duvoisin RC (March 1983). "Homer's moly identified as Galanthus nivalis L.: physiologic antidote to stramonium poisoning". Clin Neuropharmacol. 6 (1): 1–5. doi:10.1097/00002826-198303000-00001. PMID 6342763. ↑ Jeremy M. Berg; John L. Tymoczko; Lubert Stryer. (2006). Biochemistry. New York, NY: Freeman. ISBN 978-0-7167-6766-4. 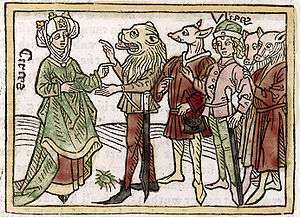 Wikimedia Commons has media related to Circe. "Circe". The New Student's Reference Work. 1914.